HUH?! What’s a second first? Turns out Jessie was so malnourished from and preoccupied with her anorexia during the months prior to going to residential treatment that she was unable to be fully present, to manifest her true spirit, to be spontaneous and receptive to connection. Although they’d spent hours together talking about the disease and the toll it was taking on her life, Jessie’s attachment to it was like me with a coveted bone—single mindedly consumed by it. She couldn’t resonate with the concerns expressed for her health, or feel the empathic impact of loving regard my mom tried to convey. Jessie’s bone was her bony body and she was devoted to preserving it. Jessie was a freshman in college during this time, and getting straight A’s was her other passion. She didn’t realize the added effort it took to accomplish this with a “brain on anorexia” as my mom likes to say. Jessie’s 4.0 was only further confirmation to her that she was thriving, not dying. It was several weeks into residential treatment before the light within Jessie began to glimmer, and she had the disorienting experience all those who’ve recovered from an eating disorder describe: Looking back on their lives with new eyes, re-visioning their past through a whole vs. a hollow lens. It’s simultaneously liberating and daunting. This is another way in which second firsts come into play. my mom suggested she embrace it as an opportunity for second firsts, to use her vulnerability to her advantage and dare to find out who her whole self was in relationship! This all sounds a lot more complicated than what us pups do when we reunite, but we have the apparent blessing of not being self-conscious. I’m planning to test the theory of second firsts at home tonight and see if it applies to my supper! 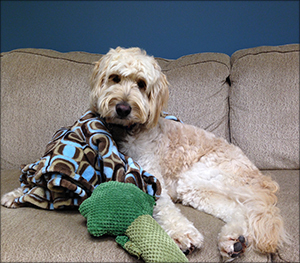 Wheeler the Healer is a certified therapy dog belonging to Beth Hartman McGilley, PhD, FAED, CEDS. He loves people, being wet, and stealing socks.